Jenn at a Country Girl's Ramblings is hosting Simply Saturday's . It's where you share pictures that remind you of a simple life and of home. Do you ever have those moments in life where you could embed into your memory forever like, well a photo? Well here's mine from yesterday. Enjoy Saturday, simply! Have a great weekend! I can see why you will always remember this, what a sweet moment, you can feel the emotion here...Have a wonderful week-end! I had to cut my post short as we ran to soccer practice or I would have gone into more detail. What was so sweet about this, that a picture can't capture, is the cat was watching something outside that made his tail swish back and forth with extreme speed. 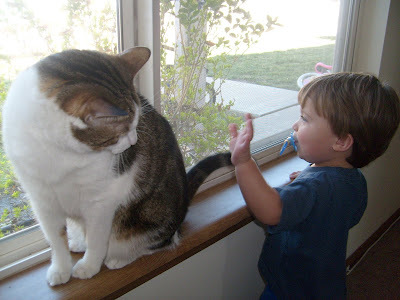 Elias became fascinated and was standing there trying to catch his tail and would laugh hyterically everytime the cat's tail would touch his hand! It was great! Hi there! I'm visiting from A Country Girl's Ramblings! I'm also now following! Your picture (and later explanation) for today is just precious! Cute pic! I am one of your newest fans from Bloggy Moms.